One of the most abundant minerals on the planet, quartz's uses range from semi-precious gemstones to electronics device components. Quartz is a common mineral that is found all across the world. In fact, it is one of the most abundant elements in the Earth's crust. There are many different types of quartz, including quartz that is of very high quality and considered to be precious gemstones. Quartz has many uses, from jewelry to components in electronic devices. 4. Where is Quartz Found? Quartz is one of the most abundant minerals in the Earth’s crust. Deposits of quartz are spread out across all continents and occur in all types of rocks, including igneous, metamorphic, and sedimentary. Quartz is the dominant mineral of mountain landscapes. Beaches, rivers, and deserts all contain quartz sand as one of their prominent materials. 3. What Does Quartz Look Like? Quartz usually appears in the form of circular or hexagon-shaped crystals. Quartz is an extremely durable substance that is highly resistant to both physical and chemical weathering. Quartz may contain various impurities which creates different varieties. Pink-colored quartz is referred to as "rose quartz", while "citrine quartz" is yellow or orange-colored. "Amethyst" is purple quartz, "smoky quartz" is grey to black in color, and "milky quartz" is white in color. 2. What is Quartz Used For? Quartz can be used both as a building material and as a decoration.Quartz sand is extensively used in the glassmaking industry to make different types of glass, such as fiberglass, flat plate, and container glass. Quartz is also used in foundry work. Quartz can find uses in the petroleum, rubber, and paint industries. The railroad and mining industries also utilize quartz sands for traction purposes. Quartz crystals are used to build electronics like cell phones, watches, and televisions. Amethyst and rose quartz are especially prized quartz varieties that are used as semi-precious gemstones. Quartz deposits are found in many countries across the world. Arkansas, in the United States, and Brazil are the largest producers of natural quartz in the world. Natural quartz crystals are usually accompanied by a high degree of physical and chemical impurities, and therefore require extensive processing in order to produce quartz that is suitable for use in electronics. High-grade quartz crystals are often manufactured in laboratories where it is refered to as "cultured quartz". 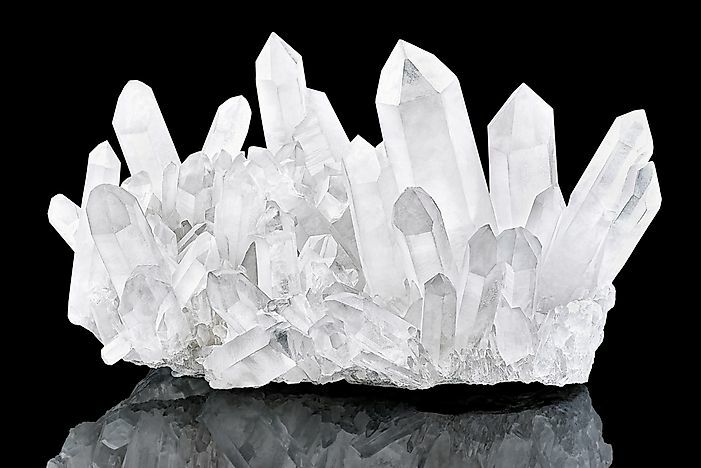 "Lascas'" are seed crystals required for the growth of cultured quartz. Lascas are produced in Brazil, Canada, Germany. China, Venezuela, and South Africa.